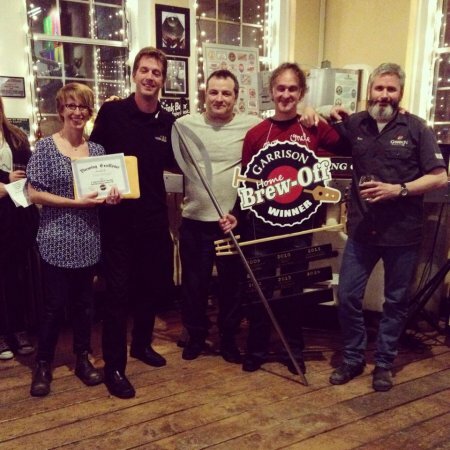 HALIFAX, NS – At a gala event held last night at Garrison Brewery in Halifax, the winner was announced for this year’s 6th annual edition of the Garrison Home Brew-Off Challenge. The winner of this year’s competition – which challenged homebrewers to create a Weizen – was Jason McDougall. His recipe was chosen as the best of 76 entries from all three Maritime provinces via three rounds of judging featuring 13 BJCP-certified judges. As is the custom at this annual event, the gala also celebrated the previous year’s winner, Peter Welton, who worked with Garrison brewmaster Daniel Girard to scale up his recipe for Saint Peter’s Belgian-Style Strong Ale. The result will be available soon in bottles at the Garrison retail store, private liquor stores, and select NSLC locations in Nova Scotia.